‘The Sacred Made Real’ presents a landmark reappraisal of religious art from the Spanish Golden Age with works created to shock the senses and stir the soul. Paintings, including masterpieces by Diego Velázquez and Francisco de Zurbarán, are displayed for the very first time alongside Spain’s remarkable polychrome wooden sculptures. I find this business of coloured sculpture intriguing, because of course if you’re aiming for verisimilitude it makes perfect sense; and yet, largely by historical accident, we have come to expect sculpture in the fine art tradition to be in the bare material, whether marble, bronze or whatever. These works looks especially foreign from a Protestant perspective. And yes, I know I keep going on about being an atheist, but I’m clearly a Church of England atheist when it comes to my religious sensibilities. 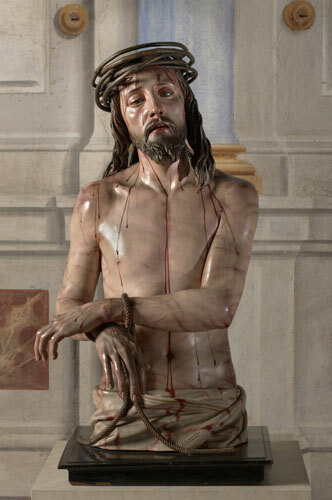 And the Protestant aesthetic of whitewashed churches and plain glass is explicitly intended to contrast with this kind of art; it is sculptures like these that are processed through the streets of Seville in Holy Week by masked penitents, which must be the apotheosis of the bells and smells side of Catholicism. Protestants over the years have found that either tawdry and vulgar or solemn, dignified and mysterious, according to taste, but one way or the other it has a fascinatingly exotic quality for those of us brought up with the tea and biscuits kind of Christianity. My initial reaction to these sculptures was ambivalent; there was something spooky or creepy or just a bit odd about them. And I don’t mean the gore; the head of John the Baptist where the cross section of the neck looks like something from the butcher’s, or Christ bruised and dripping with blood. No, even the statues of saints and the Virgin seemed a bit creepy at first encounter. St Ignatius Loyola, with his dark robes, looks like something that might lurch out of the dark at a carnival ghost train. I’m tempted to invoke the uncanny valley, but actually I think it’s mainly simple unfamiliarity. The sculptures only seem like something from Madame Tussauds — something other than fine art — because of my expectations. Eventually, once I had been in the exhibition for a while, that sense of novelty wore off a bit; and eventually I was able to stop overthinking it and start to respond to the works as pieces of art. And once that happened I did start to appreciate them and find them quite effective. They are not my new favourite thing, and I’m still not sure I’d say I really like them, even. But I’m certainly glad I went. Thought-provoking stuff. There are also some fine paintings in the show as well, incidentally, by Velázquez and Zurburán particularly; but those were more familiar and less interesting to me, except in the way they provide a context for the sculptures. It is interesting, for example, that although they are recognisably part of the same religious culture, the paintings are immediately and obviously ‘art’, while my reaction to the sculptures was so much more difficult. Even though I would have grown up closer to that culture than you did, I still find the statues a little creepy, though when they are inside a church they fit. There’s something about pulling them from their context that makes them seem so alien to me. There’s something about pulling them from their context that makes them seem so alien to me. There’s probably something in that, although if they were paintings originally intended for a church it wouldn’t seem surprising to see them in an art gallery. I’m not quite sure why that is.